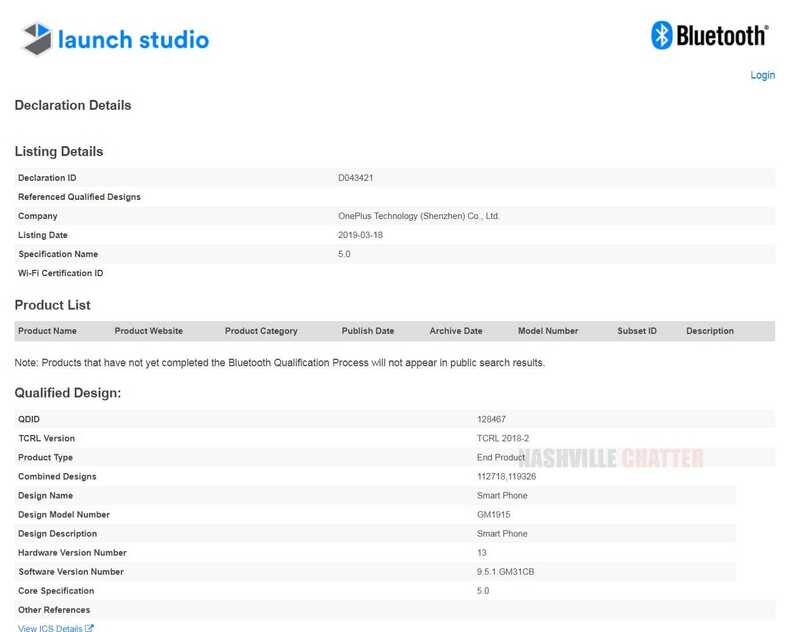 An alleged OnePlus 7 smartphone with model number GM1915 has appeared on Bluetooth SIG database today. Recent reports suggest that OnePlus may announce the OnePlus 7 smartphone in the second quarter of the year. If the GM1915 is really the OnePlus 7, it may appear on other certification sites before it goes official in the next quarter. The OnePlus GM1915 Bluetooth SIG listing has no information on its specifications. It only confirms that the phone carries support for Bluetooth 5.0. Recent rumors have revealed that the OnePlus 7 will be arriving with a triple camera setup on its rear. The OnePlus 6T phone from last year that came with waterdrop-style display was the first handset from the company to feature an in-display fingerprint reader. Speculations are rife that the OnePlus 7 will be equipped with a notch-less screen like the recently released Oppo F11 Pro and Vivo V15 Pro. Recent leaks point that the upcoming OnePlus 7 phone will come in three gradient color finishes on the rear side, similar to the Thunder Purple edition of OnePlus 6T. The colors are Black-Purple, Cyan-Grey and Black-Yellow. Also, the OnePlus 7 will come with a pop-up selfie camera since it will be equipped with super-slim top bezel. Hence, the upcoming OnePlus 7 flagship phone is expected to deliver above 90 percent screen-to-body ratio. It will continue to feature an in-display fingerprint sensor. There is no information available on the specifications of the OnePlus 7 smartphone. However, it is very likely to feature the Snapdragon 855 mobile platform. Probably, it will come with 8 GB of RAM. The OnePlus 7 may not carry support for 5G connectivity. However, some reports have claimed that the company will launch a different smartphone in the near future that will carry support for 5G connectivity. It is yet to be confirmed whether the 5G enabled OnePlus could be a higher edition of the OnePlus 7 phone. Probably, this variant may release in the market as OnePlus 7 Pro. Readers are advised to wait for further reports to know about the upcoming OnePlus 7 smartphone and the company’s first 5G phone. triple cameras: 48MP+20MP+5MP and 16MP pop up selfie camera. 4000mAh battery, 44W super fast Dash charging. Oxygen OS 9 base on Android 9.0 Pie.